Reasoning from the Scriptures: Morph! Are we really supposed to be conformed to the image of the culture? Morph! Are we really supposed to be conformed to the image of the culture? Today we are being told to water down God’s Word in order to be relevant because people will not listen to clear truth – “This has clear implications for those weekend talks we give called the sermon. People are looking more for a path than pontification. They long for a path pointing them toward spiritual discovery – discovery those of us in the church are still experiencing with humility. Pontification that has the smell of doctrinaire arrogance is simply the phony turn off many outside the church have come to expect from those of us inside the church” (Ron Martoia, Morph: Group Publishing, 2003, pg 19. emphasis mine). Pontificate: to speak in a pompous or dogmatic manner (Webster’s Universal College Dictionary). I guess that the man who dares to be dogmatic and preach sound doctrine is too “pope-ish” and arrogant. While there are abuses, the true man of God cannot avoid being labeled “arrogant”, “dictator”, and all sorts of evil if he is true to the Word of God. “Blessed are you when people insult you and persecute you, and falsely say all kinds of evil against you because of Me. Rejoice and be glad, for your reward in heaven is great; for in the same way they persecuted the prophets who were before you” (Matthew 5:11-12). God hasn’t called me to give “weekend talks”, He has called me to preach His Word and in so doing I must speak what I have seen and heard and I must say, “Thus says the Lord.” Shall I water down God’s Word in order to be relevant? Shall I be like Ron Martoia who gave the example of Chad and Christina? Chad, who “just couldn’t buy the ‘pat answers,’ and Christina who “would try church if ‘my kids don’t get brainwashed into believing this “Jesus is the only way to heaven” stuff’” (pg 20). And then Martoia said, “A year and a half later, they’re relatively consistent attendees at Westwinds and are slowly getting involved, cautiously exploring, and becoming noticeably intrigued by those around them” (20). What has he preached in a year and half? So what if they become members and regular attendees at Westwinds? Will that make them saved or deceived? Pragmatically speaking Martoia will be very successful – but what about biblically speaking? Not only are we being told to depart from God’s Word by watering it down, we are also being told to defile ourselves with the world by conforming to the world. 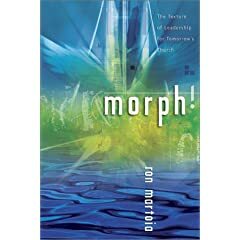 Martoia’s thesis is that in order to influence the world we must “morph” into the image of the culture which is the opposite direction in which the Bible uses the word metamorphe. He even uses 1 Corinthians 9:20-22 to attempt to prove that we are to be like the world (16). In his quest for “cultural context”, Martoia completely misses “scriptural context.” The context of 1 Corinthians 9:20-22 is found and begins in 1 Corinthians 8:1, “Now concerning things sacrificed to idols…” and ends in 1 Corinthians 10:31-33, “Whether, then, you eat or drink or whatever you do, do all to the glory of God. Give no offense either to Jews or to Greeks or to the church of God; just as I also please all men in all things, not seeking my own profit but the profit of the many, so that they may be saved.” Paul wasn’t speaking of conforming to the world to give them what they want – he was speaking of building bridges to give them what they need. No Jew would listen to Paul’s presentation of the Gospel if they were offended by him eating food that wasn’t “kosher.” No Gentile would listen to Paul’s presentation of the Gospel if they were offended by having to become Jews in order to be saved. No church would listen to Paul if they were offended by his conformity to the world – this man who said do not be conformed to the world (Romans 12:2) and that the world was crucified to him and he to the world (Galatians 6:14). Martoia gives the quintessential example of philosophical humanism with his interpretation of the incarnation: “The quintessential example of genius intersection is, of course, the incarnation: God’s presence, voice, and message piercing and penetrating 1C culture. As we simply observe the potency of the incarnation, several things come to mind. God sent Jesus as a person. God could have sent the message packaged any number of ways. He didn’t choose a CD player to herald the good news, a Web page that automatically pops up every time someone logs on, or an MP3 download into our ear canal. The fact that he sent a person bespeaks God’s desire to be relevant, understandable, approachable, and relational” (pg.17 emphasis mine). Could God have redeemed any other way? According to Martoia, “God could have sent the message packaged any number of ways.” But according to God’s Word, “Therefore, since the children share in flesh and blood, He Himself likewise partook of the same, that through death He might render powerless him who had the power of death, that is, the devil, and might free those who through fear of death were subject to slavery all their lives. For assuredly He does not give help to angels, but He gives help to the descendents of Abraham. Therefore, He had to be made like His brethren in all things, so that He might become a merciful and faithful high priest in things pertaining to God, to make propitiation for the sins of the people. For since He Himself was tempted in that which He suffered, He is able to come to the aid of those who are tempted” (Hebrews 2:14-18). Did God send Jesus for the purpose of cultural relevance? According to Martoia, “The fact that he sent a person bespeaks God’s desire to be relevant, understandable, approachable, and relational.” This is a gross misinterpretation of the incarnation. No wonder people could sit through his “weekend talks” for a year and a half and never be brainwashed into believing “this Jesus is the only way to heaven stuff.” Martoia obviously isn’t interested in preaching the truth of God’s Word but in speaking the language of the world – “they (false prophets) are from the world; therefore they speak as from the world, and the world listens to them. We (true prophets) are from God; he who knows God listens to us; he who is not from God does not listen to us. By this we know the spirit of truth and the spirit of error” (1 John 4:5-6). Watering down the Word of God (departing from the Word) and being like the world to win the world (defilement with the world) leads to the supreme outcome of apostasy (deceived by our own works). The Purpose Driven, Seeker-Sensitive, Emerging Church movements are harbingers to the deluding influences spoken of in 2 Thessalonians that God is going to use to “first, gather up the tares and bind them in bundles to burn them up; but gather the wheat into My barn” (Matthew 13:30). “In regard to the coming of the Lord Jesus Christ and our gathering together to Him….Let no one in any way deceive you, for it will not come unless the apostasy comes first…(2 Thessalonians 2:1, 3). These movements are against everything God has called me to stand for and He has called me to stand against everything these movements stand for. Let no one in any way deceive you!